Music Review Analysis of Himesh Reshammiya's album Action Jackson (2014). The song begins with mischievious teasing theme piece in unplugged mode. Himesh gets in his middle octave zone and sings the mukhda lines with non nazal uber cool style, with casualness and soothing feel which is pleasant. His vocals glide through smoothy. Himesh's lines, SOM MANGAL BUDH GURU SHUKAR SHANI RAVI (awesome emphasis) along with trumpet, are sung with arrogant feel emphasis vocals. Himesh's lines, AAJA MERI GALI * 4 (simple and effective repetitive hook) are sung with nasheela suroor as if in a high state of nashal. Neeti belts out her lines in high pitch with fun jovial vocals. It is a feeling that the female portion would have sounded better with low Alto vocals in low pitch range, by a singer like Shilpa Rao. Between mukhda & 1st stanza, mischievious teasing theme piece plays. Himesh sounds good in the range somewhere in between high and middle from 1.25 to 1.32 on quick simple compositional notes, yet sounding non nazal and thus excelling in his singing capabilities. He sings with a carefree bindaas attitude. Himesh's lines 1.34 to 1.39 are easy on the ears from, in this avatar there should be no complains from the detractors of his high pitched nazal voice. Between 1st & 2nd stanza, feel good guitar from 1.58 to 2.05 is followed by mischievious teasing theme piece. Himesh sounds good in the range somewhere in between high and middle from 2.15 to 2.22 on quick simple compositional notes, yet sounding non nazal and thus excelling in his singing capabilities. He sings with a carefree bindaas attitude. Himesh's lines from 2.24 to 2.29 are easy on the ears, in this avatar there should be no complains from the detractors of his high pitched nazal voice. 1. Himesh's fine tuned middle octave vocals with non nazal uber cool style. 2. Neeti's fun jovial high pitched vocals. 3. Underlying free flowing foot taping rhythmic beat with fluctuating bazz sound. 4. Mischievious teasing theme piece, feel good rotary guitar and trumpet. The semi plugged synth beat joins in from 0.07 onwards to buid up the song. The male chorus sing in a happy-go-lucky mode and suits the song. The prolonged mukhda hook is simple yet catchy. It is broken into two hooks, the slow paced catchy hook from 0.28 to 0.39, 0.45 to 0.48 and the fast paced catchy hook from 0.39 to 0.45, 0.45 to 0.54 whereby the catchiness is enhanced by the hooks alternating and shifting with each other from slower to faster to slower, along with the prolonged length. The pattern and template of this mukhda hook comes from the same thought process behind the hook of MADHUSHALA MEIN and HOOKAH BAR. Underlying Punjabi dhol beats from 0.40 onwards are full on rhythmic. Off-da-hook fast drum-roll hits from 0.47 to 0.49 in unplugged mode. The chorus goes estactic at 1.06 along with whistle piece. In between mukhda & 1st stanza, Arya belts out some feel good emphasis rap from 1.16 onwards along with funky wicked sound effect that joins in from 1.24 onwards that reflects the rebellious defying nature of party goers. The celebratory mode continues with female vocals from 1.38 to 1.57 in semi plugged mode along with Arya's intermittent rap. The composition structure of male lines from 1.57 to 2.03 is better than the female portion. The intermittent energetic Punjabi chants HA HA enhance the upbeat nature. Rwakin fluctuating bazz sound from 2.15 to 2.18 gets listener into da zone and feel it. In between 1st & 2nd stanza, a wicked synth tune from 2.37 to 2.43 is followed by trumpet 'Band Baaja Baaraat' tune from 2.43 to 2.51 along with underlying fluctuating bazz sound. The compositional pattern of male lines from 2.52 to 3.09 is simple and peppy, sung with jovial vocals. The composition structure of male lines from 3.10 to 3.17 is catchier than the previous lines. 2. Underlying full on rhythmic Punjabi dhol beats. 4. Peppy Punjabi flavored beat, off-da-hook fast drum-roll hits and off-da-hook quick raw heavy drum skips. 5. Arya Acharya's feel good emphasis rap. The song begins with teasing cat-calling eve-teasing male vocals, joined in by underlying bazz sound in unplugged mode. The mast tapori semi plugged beat kicks in from 0.06 onwards to build up the song, joined in by mischievious teasing oscillating modulated theme piece from 0.13 onwards. The semi plugged mast tapori beat joins in from along with Shalmali's vocals builds up the song. She sings in Piya Ke Bazaar Mein (Humshakals) mode. Her mukhda lines from 0.27 to 0.40 & 1.09 to 1.15 are actually the best lines in song. The mast tapori beat kicks in from 0.48 onwards. Himesh is back to his high pitched antics in the repetitive mukhda hook CHICHORA PIYA which kind of sounds odd, also courtesy due to the lyric. This hook could be more appealing if the lyric of hook line could be different, and if it was sung in mid range instead of high pitch just as how the same female portion is sung in mid range. Between mukhda & 1st stanza, a peppy interior Banarasi Babu tune piece plays from 1.37 to 1.57 followed by mischievious teasing oscillating modulated theme piece. The compositional pattern of Himesh's high pitched lines from 2.04 to 2.18 comes from Sufi Rwak school of music. Shalmali enjoys her stint behind the mike in her portions. Her lines, TERI HARKATON NE TERI FITRATON NE * 2 ZARA DEKH KYA HAAL MERA KIYA from 2.18 to 2.32 are actually the best lines in the song. The compositional pattern of Himesh's high pitched lines from 3.13 to 3.27 comes from Sufi Rwak school of music, sung with MADHUSHAALA MEIN (DAMADAMM) mode. Her lines, TU CHAMMIYA CHABILA BADA HAI RANGEELA * 2 TUNE HAI BADA JHATKA MUJHKO DIYA from 3.28 to 3.41 are actually the best lines in the song. The song begins with off-da-hook catchy guitar riffs and off-da-hook traditional drum hits. Ankit Tiwary and Palak Mucchal are the apt choices. Palak Mucchal has come into her own element since Ice Cream Khaungi and she sounds melodious. Palak's lines in semi plugged mode from 0.17 onwards build up the song. Palak's line, HAAAAA (prolonged) -AAI (awesome sudden abrupt quick twist, comes from Himesh's Sufi Rwak school of music) from 0.21 to 0.23 & 0.33 to 0.34 has a similar thought process behind Alka's line, DARNA HA-AAAAAA (prolonged) - AAA (up twist) from 2.32 to 2.35 in SACHE AASHIQ from SHAADI SE PEHLE, Shreya's line AAAA (prolonged) AAA (up twist) from 2.26 to 2.30, 2.32 to 2.35, 4.18 to 4.22 & 4.24 to 4.27 in MAINE CHUN LIYA from DIL MAANGE MORE. The repetitive mukhda hook BAS TERI BAS TERI DHOOM HAI BAS TERI BAS TERI DHOOM is well structired and effective, and additional intense emphasis modulated vocals make it more effective. Ankit sings with his trademark heartfelt vocals. Off-da-hook Quick drum roll hits from 0.51 to 0.52 & 1.27 to 1.28 catch the listener's pulse. Off-da-hook heavy drum hit at 1.10 catch the listener's pulse. Between mukhda & 1st stanza, warm strings are accompanied along with Ankit's passionate high pitched alaap from 1.39 to 1.51, followed by snake charm theme piece. The compositional pattern of Palak's lines from 2.04 to 2.15 is simple and free fowing. The compositional pattern of Palak's lines from 3.21 to 3.33 is simple and free fowing. 1. Ankit Tiwary's heartfelt vocals and Palak Mucchal's melodious vocals. 2. Off-da-hook underlying traditional drum beats. 3. Off-da-hook catchy guitar riffs at start, off-da-hook fast drum roll hits and off-da-hook heavy drum hit that catch the listener's pulse, snake charm theme piece. 4. Warm strings in between 1st stanza gap, combo of guitar riffs and flute in sync followed by alaap in between 2nd stanza gap. 5. Additional intense emphasis modulated vocals along with the repetitive mukhda hook. The lead guitar theme piece plays from 0.15 onwards in semi plugged mode. The heavy beats joins in from 0.23 onwards. Neeti's mukhda line along with the 'pump it, push it up' beats is as if a chick is working out in the gym. Lyrics of her line make no sense at all except being wannabee seductive. The underlying wicked bazz sound effect from 0.46 to 0.50 is good. The repetitive mukhda hook YOU ARE MY GANGSTER BABY sung with enthaustic arrogant flair appeals only to an excent. It is the best part of song. Between mukhda & 1st stanza, more old style retro funky lead guitar from 1.23 to 1.35 is followed by clap of hands from 1.35 to 1.39, suggesting its Aerobics time. Neeti's lines don't have much appeal whatsoever. The original is better than the remix. The remix has an intermittent spooky sound at 0.07, 0.09, 0.11 and so on along with remix beats. the remix beat doesn't have in it to make party goeas shake a leg to it, and it seems forced to sync with the tempo of song and its vocals. The tempo of original has been increased and arrangements with more Dhol beats. Though the remix is apt for party goers to shake a leg and the treatment give to enhance the Punjabi flavor and essence, a remix by DJ Akbar Sami with Calypso beats (like in Dil Tumhare Bina Remix) would made this remix more catchier. The remix has been given a Desi flavor similar to Hai Apna Dil - Desi Mix from The Xpose, by having mast desi ishtyled tapori add on beat. Unlike Hai Apna Dil - Remix which had an interesting twist, this one is a sore thumb and loses steam midway through the mukhda. It is rather needless. Perhaps the idea was right to enhance the Tapori feel in remix, but somehow the execution doesn't work. An alternative treatment may have been tried instead. Himesh's and Neeti's vocals from 1.34 to 1.39 are combined. Neeti's vocals in low Alto pitch from 2.15 to 2.18 followed by high pitch from 2.19 to 2.22 is an interesting mix. In totality, both versions sound equally good but the reprise version has slightly more variety and variation. Nothing much really to choose or differentiate in between the two, in terms of picks. It is a decent harmless hummable melody. The song grows upon the listener with repeat hears. The orchestration has been given extra focus and results are there to be seen. Production and sound design wise, it is one of the better melodies from Himesh's stable in recent years in terms of music arrangement, and should serve as a standard benchmark template. Best lines of song are Palak's line, HAAAAA (prolonged) -AAI (awesome sudden abrupt quick twist, comes from Himesh's Sufi Rwak school of music) at 0.34 & 0.10, Ankit's line, HAR JAGAH AB DIKHE TU, APNE DIL KA BHI KAAM TAMAAM HAI (awesome compositional notes) from 0.47 to 0.52 & 1.22 to 1.28, and the well structured effecitve mukhda hook. The song has its own composition, but the sound design seems to be on the pattern of Saathiya from Singham and Saanson Ne from Dabangg 2. The song with overall compositional template, orchestration n arrangement actually sounds from Vishal Shekhar and Sajid Wajid's stable, and could easily fit into a Dharma productions flick or Dabangg series. Himesh - the composer is not known for such songs, so he steps into a different terrain. Himesh's middle octave singing should appeal to all. He excels as a singer and shows his prowress in middle octave range. He shows that he can sound different with so many singing variarions even in the same range i.e. he can sing with different tones n styles in different ranges, because he has sung in the mid range before but not sounded like this, which would be something new for listeners and surprise for detractors. This is a song that could fit into Himesh's album Chalo Ishq Ladaaye (2002). It has a free flowing compositional pattern with foot tapping beats and sung with carefree bindaas jovial vocals. There is nothing novel about the composition which is deja-vu run of the mill stereotype, but its the treatment given to it that makes it catch the attention i.e. the orchestration, the way it is sung and the lyrics that give it trendy cool appeal. Himesh used the voice of Keeda at start of Raat Hai Soyi Soyi from Main Aisa Hi Hoon, in the backdrop when Ajay Devgn and Baby Aparna are having a conversation. One would have never thought that he would compose a song with the title Keeda. This song is one of Himesh's more catchier Punjabi flavored song, compared to his other songs in this genre. It is an upbeat vibrant energetic ceebration song. It is going to get the best response on screen in theatres. Best tune is the mukhda line, SURYA AAST, PUNJABI MAST from 0.28 to 0.39 & 0.45 to 0.48, Best orchestration is off-da-hook fast drum-roll hits from 0.47 to 0.49 in unplugged mode, and Rwakin fluctuating bazz sound from 2.15 to 2.18 gets listener into da zone and feel it. For more impact, the song could have been slightly shorter towards the end and it could have ended earlier, by trimming the repetitive mukhda hook towards the end, which is rather prolonged, gets repetitive and takes away the effectiveness of the hook as it is over heard rather excessively towards the end. N.B = Although Punjabi Mast has a catchier mukhda hook, the song's impact upon repeat hears gradually decreases...but on other hand, the impact of Keeda sustains and it grows or atleast maintains level upon repeat hears. Keeda also has better overall audio appeal over Punjabi Mast, courtesy due to lyric of hook line Surya Aast, Punjabi Mast. Keeda has most repeat hear value in album. The repetitive mukhda hook CHICHORA PIYA in Himesh's high pitched vocals kind of sounds odd, also courtesy due to the lyric on repetitive loop. This hook could be more appealing if the lyric of hook line could be different, and if it was sung in mid range instead of high pitch just as how the same female portion is sung in mid range. Forget even the high pitch (as Himesh also sung stanza portions in high pitch, so to sing the mukhda hook in middle range and stanzas in high pitch may not suit overall), even if the mukhda hook had some other suitable lyrics, the song would have had a better impact. Although fans wouldn't mind it as such, but upon hearing Himesh's high pitched vocals on the mukhda hook, detractors who would have rather appreciated Himesh's smooth pleasing vocals in Keeda would go running to find the skip button as soon as possible for this song. With regards to orchestration template, it is created keeping Chalao Na Naino Se Baan Re (Bol Bachchan) in mind which was also picturized on Ajay Devgn, with a masti filled twist whereby hero heroine are having fun eve teasing and cat calling each other. It would mainly work on screen. Best line in song is Shalmali's mukhda line, NA DEKHE AAGARI NA DEKHE PICHARI KARE CHEDKHAANI JALAAYE JIYA, TERI HARKATON NE TERI FITRATON NE * 2 ZARA DEKH KYA HAAL MERA KIYA in 1st stanza from 2.18 to 2.32, TU CHAMMIYA CHABILA BADA HAI RANGEELA * 2 TUNE HAI BADA JHATKA MUJHKO DIYA in 2nd stanza from 3.28 to 3.41, Shalmali does full justice to the song. Mukhda of Chichora Piya could have sounded better with a different treatment i.e. different lyrics with slower tempo n loungish feel. Its kind of wasted due to choice of orchestration n lyrics. This song had potential to rank higher, if not for the lyric of the high pitched repetitive mukhda hook line which killed a lot of impact, despite other portions being decent especially the ones sung by Shalmali which appeal. Set is very colorful, song is shot very well. Overall it is aesthetically good and eye candy to watch. Sonakshi showing tummy is interesting. If this was supposed to act as the title track, then it is way below expectations. One would have expected a killer title track with a catchy repetitive title hook 'Action Jackson'. It seems more like a gym aerobics song rather than a theme piece, or perhaps it comes at a point where AJ's character intro is in a place where Sonakshi Sinha is working out and he checks her out. The song also has a South and retro flavor and seems to be made under Prabhu Deva's directive and creative input. Best part of song is the repetitive mukhda hook, You Are My Gangster Baby...AJ sung with enthaustic arrogant flair. The remixes don't add value to the album and are an unnecessary add-on. If at all they had to be included, they should have been given a better treatment with different beats and flavor. Composition wise, two songs (Dhoom Dhaam and Punjabi Mast) have better tune than the remaining three (Keeda, Chichora Piya and Gangster Baby) which are average tunes. Dhoom Dhaam is a decent hummable melody that grows upon the listener, with a well structured effective repetitive mukhda hook. Punjabi Mast is one of Himesh's more catchier Punjabi flavored song, compared to his other songs in this genre. > Best orchestration is in Dhoom Dhaam which is crisp and of high quality standards and attention to detail, in terms of production value. Off-da-hook underlying traditional drum beats, off-da-hook catchy guitar riffs at start, off-da-hook fast drum roll hits and off-da-hook heavy drum hit that catch the listener's pulse. > Rwakin fluctuating bazz sound from 2.15 to 2.18 and off-da-hook fast drum-roll hits from 0.47 to 0.49 in Punjabi Mast. > Himesh excels in Keeda in his middle octave mid range avatar. > For a singer who sings selectively nowadays, Himesh should avoid singing average songs like Chichora Piya, Pe Pe (Shortcut Romeo), Jaave Saari Raat (Shortcut Romeo), Piya Ke Bazaar Mein (Humshakals). When the name of Himesh Reshammiya the singer appears on the album credits, the song should be benchmark and special rather than a mediocre, or else the exclusivity factor goes away in terms of expectations. > Ankit Tiwari and Palak Muchal excel in Dhoom Dhaam. Ankit sings with his usual style of heartfelt vocals. Pakal's vocais sound melodious, and this is one of her better sung songs for Himesh. > Shalmali does full justice to Chichora Piya, she is apt and sings in the perfect mode and tone for such a song's mood and requirement. > Happy-go-lucky male chorus in Punjabi Mast. Lyrics are pedestrian run of the mill stuff with a touch of wacky and wierdness. Nothing novel here. They act as spoilsport. Especially, the lyricist/s should ensure that repetitite mukhda hooks should have easy listener friendly lyrics that don't sound odd in a repetitive loop e.g. Chichora Piya * 4 and be comprehensible i.e. Surya Aast Punjabi Mast rhymes and fits it well, but still leaves listeners wondering what is the connection in between Surya Aast and Punjabi Mast. A hook may be decently catchy but the lyric could render it senseless comic joke, so that albeit sounding catchy it also sounds hilarious. Also, Bas Teri Dhoom Dhaam Hai, Bas Teri Dhoom doesn't make that much sense, and in the line Har Jagah Ab Dikhe Tu, the line Dikhe is sung forcefully with emphasis, usually it is not pronounced like that. The album has decent songs like Punjabi Mast, Keeda (which would appeal to youth) and Dhoom Dhaam (which has universal appeal). Remaining two songs Chichora Piya and Gangster Rap have a strict onscreen situational appeal. The album grows on the listener with time upon repeat hears. Over the pasr year or so, Himesh has changed his compositional style and ventured into new territories. Whilst he has been giving decent songs, it is of the view that over the last couple years, Himesh albums have had relatively 'soft' melodies like Teerat Meri Tu (Policegiri), Khali Salaam Dua (Shortcut Romeo), Tu Hi Tu (Kick) which don't quite have the magical midas touch or the catchy melody impact that his melodies from previous eras had, and peppy title tracks like Pe Pe Pe (Shortcut Romeo), Caller Tune (Humshakals) which are not quite the killer chartbusting title tracks previous Himesh albums had. Hence, the songs of Himesh's recent albums dont have the same recall value as compared to songs of albums in his previous eras, and have had a shorter shelf life. They just about do the work of being apt for the film's genre. The exception to this is Jumme Ki Raat and The Xpose album which had some great songs. Even last year, it was a low key year with albums like Policegiri and Shortcut Romeo which didn't have memorable songs of recall. It is of the view that Himesh should be selective of not scoring for too many action masala and comedy flicks, but films where there is scope for great music with longetivity. Upcoming projects like All Is Well and Prem Ratan Dhan Payo should help in this regard. Also, there is a feeling that Himesh is giving certain template based songs which are different versions of the original atleast in orchestration aspect, and hence becoming predictable e.g. the orchestration of Go Go Govida from OMG, Jaave Saari Duniya from Shortcut Romeo, Jumme Ki Raat from Kick, Chichora Piya, the orchestration of Chalao Na Naino Se Baan Re from Bol Bachchan, Hum Paagal Nahi Hai Bhaiya and Piya Ke Bazaar Mein from Humshakals. Perhaps he should take a break from tamplate based songs which have a similar deja-vu pattern and feel to it. Ajay Devgn has been a huge supporter of Himesh since Bodyguard with all praise for his songs, and along with Salman Khan and Akshay Kumar, Himesh should also reserve his best and give something special for Ajay starrers to repay back this faith. 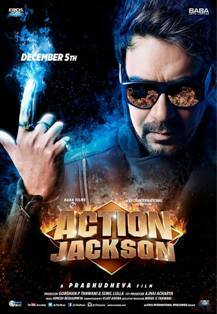 In this regard, Action Jackson falls below expectations but as far as theme and genre of movie is concerned, the music is decent and apt for it. May be if Ajay was starring in a Mahesh Bhatt flick, instead of Rohit Shetty and Prabhu Deva comedy masala entertainers, then the music scored by Himesh would be to that expected level. Bottomline, the feeling is that if Himesh is given creative space and freedom, he can do way better than this for a big banner film. Nevertheless, three songs Punjabi Mast, Dhoom Dhaam and Keeda should be enough to hold the attention of listeners, act as promotional prop and to capture the on screen musical interest of the audience in theaters.